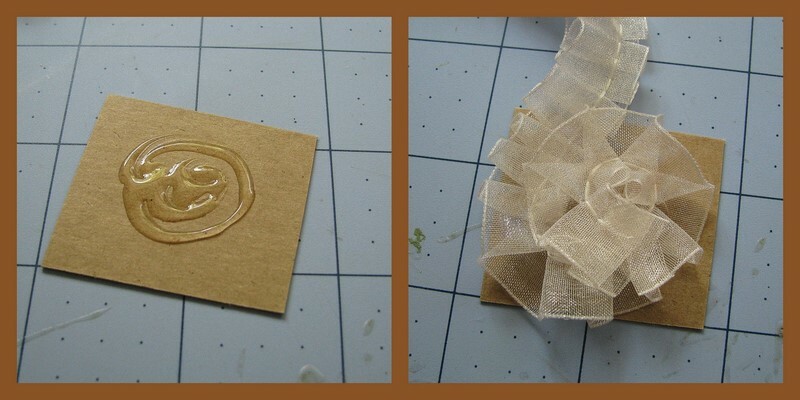 To create the ribbon flower, I cut a small square of cardboard and applied a dollop of my favorite quick dry glue. Starting in the center, I carefully wound the ribbon around until I had the flower as big and full as I wanted it. After the glued dried, I cut off the excess cardboard and added a brad in the center. 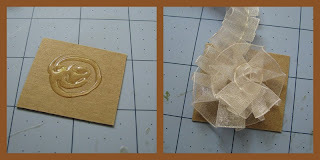 Using my Cricut Expression and pattern paper, I cut three sizes of scalloped circles for each of the paper flowers. I cut little slits at each scallop to create petals. 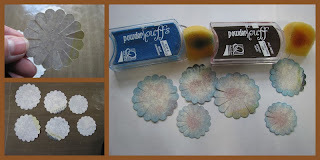 Using a piece of sponge, I applied Quick Quotes Powder Puffs ink to the edges and center of the flowers for a bit of variation of color in the flowers. I finished by stacking the three layers together and adhered with a brad. Once complete, I scrunched and curled the petals with my finger tips. Love these tutorials! I loved the ribbon one, when I seen it and was wondering how you did the perfect pleats on the flower (gorgeous) how great to use already pleated ribbon, they are truly BEAUTIFUL! Thanks for sharing! thank you soooo much! i love the ribbon flower how to! Fantastic tutorials! Loved the idea of using the chipboard underneath! Thank you for the great tips and inspiration!